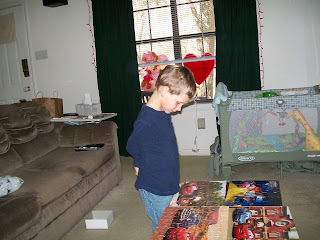 The other afternoon Dawson decided to put together all of his Cars puzzles. 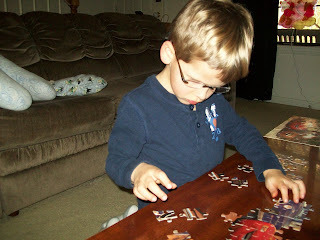 Three of them are easy 24 piece puzzles, but for the first time ever he put together the 100 piece Cars puzzle. 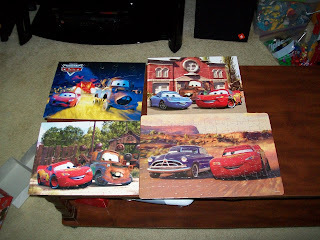 I clustered the pieces together (piles of Lightning McQueen pieces, Doc pieces, etc.) and then he pieced them together by himself. Amazing! 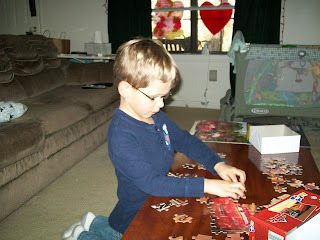 The pieces on the 100 piece puzzle were smaller than he was accustomed to so he went and grabbed Randy's reading glasses so he could see them better. LOL!! Looking for just the right piece. And looking so funny in those glasses!